The month of March was a real oystery blur for me, but I had to make sure that I wrote up a quick recap of my favorite moments during and outside of the trade show. OMG. Star struck. For a few of you who might be confused, the two gentlemen are oyster celebrities. Rowan Jacobsen is the author of A Geography of Oysters: The Connoisseur's Guide to Oyster Eating in North America, my oyster bible. He really has his ABC's down: apples, bivalves, cider. I had met Patrick McMurray a couple years ago at the Galway Shellfish Festival. He's a world champion oyster shucker, restaurateur, inventor (see: ShuckerPaddy), author of "Consider the Oyster: A Shucker's Field Guide," and all around fun guy to be around. Naturally I had to ask for a photo together and promptly posted it on Instagram. Because if it's not on social media, it never happened. Judges for the competition were Chef Chris Aerni of Rossmount Inn; Skip Bennett, founder of Island Creek Oyster Farm and Joseph Milano, owner of Union Oyster House. Patrick McMurray MC'ed the event, briefed competitors, judges, and support staff. I helped carefully shuttle completed trays of oysters backstage for judging. Post-competition with my buddies Paul Hagan and Daniel Notkin. Daniel won! Speaking of shucking, I bet you at least a handful of the competitors were using R. Murphy knives as their go-to blade. I had a chance to meet the owners of R. Murphy Knives over at the New England Food Show, which ran concurrently with the Seafood Show. I tried a few in my hands and really loved the feel of the wooden-handled Wellfleet style knife. Thanks to the uber generosity of the Younkins family, I walked away with a pretty sweet take home of shuckin' swag, just in time for my Oyster Omakase! Through a crazy mix of digital and real-world introductions, a group of us media/marketing folks (including the very lovely Michael-Ann Rowe from Off the Beaten Palate and Jessie Johnson from Sustainable Seafood Blog Conference) ended up at Row34 after reception hopping, which by the way, didn't include oysters but a lot of other delicious seafood! At Row34, we had the signature Island Creeks from Duxbury, Wellfleets, Chathams, and petite Hog Island (Sweetwaters I presume, although the menu didn't specify). The wonderful Zirlott family (and Beth Walton) from Murder Point Oysters — a new farmed Alabama oyster that will make you reconsider oysters from the Gulf. 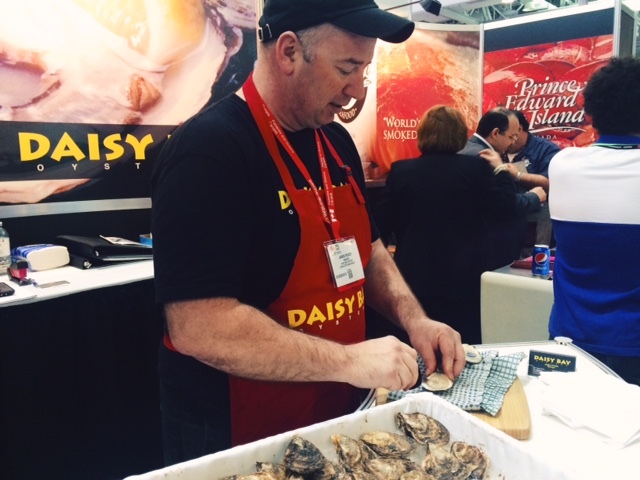 And James Power, grower of Daisy Bays, Raspberry Points, with a handful of other oysters from PEI. This winter was particularly harsh for everyone along the Atlantic Coast, but James decided to take matters into his own hands by buying a 10 ft chainsaw. Getting a peek into the scale of West Coast aquaculture with Ian Jefferds of Penn Cove Shellfish. 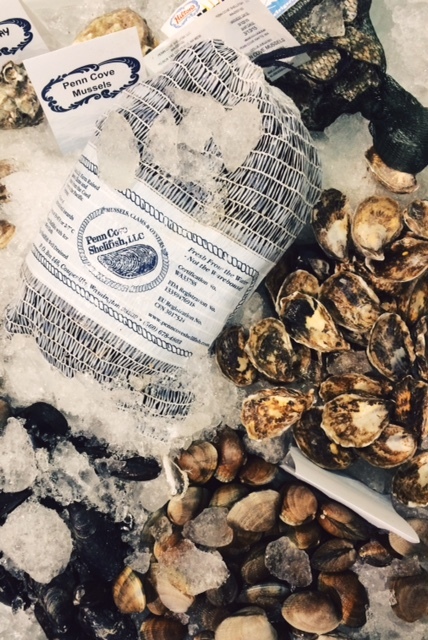 Pangea Shellfish returned with a glistening display of over 30 varieties of oysters and other shellfish. The sad thing was that none of it could be eaten! While having a chat with Ben Lloyd behind the set up, I could see the wonder and hunger in people's eyes as they walked by the display. Heather Lusk and Rich Terry from HM Terry (growers of Sewansecott oysters) showcasing a new line of packaged shellfish delights. Dave Ryan, grower of WiAnno Oysters, and his two sons, Matt and Nathan. Met up with Josh Hoch of Go Shuck An Oyster at the historic Union Oyster House. We first sat down at the oyster bar for a dozen local slurps, shucked swiftly by Jimmy. Meanwhile, Anton pulled out his oyster book —a cool compilation of articles and photographs that explained oyster culture. 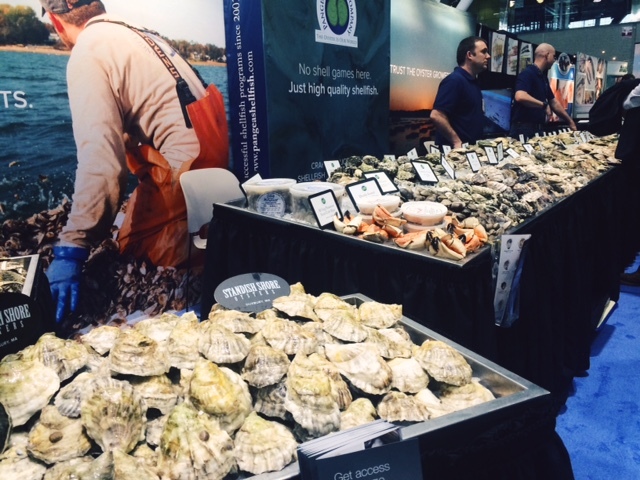 Throughout the Seafood Expo, I had the chance to sample some excellent oysters from all around the world, including mega Fanny Bays from British Columbia. A brilliantly briny and succulent Pacific oyster grown in Baja Mexico, branded as the Sol Azul oyster.